It had to happen sooner or later. 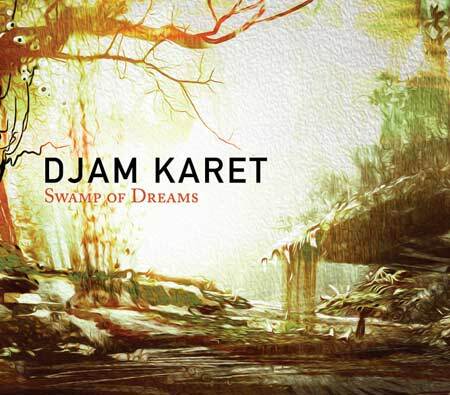 Since their earliest days, Djam Karet has always been on the front lines, contributing otherwise unreleased works to various compilations around the world, and now the band has, for the first time collected many of these contributions into a single release, Swamp of Dreams, available as both a CD and LP. The well of these rare tracks is not empty, so it’s entirely possible there could be a follow-up release at some point in time in the future. The set opens with “Voodoo Chases the Muse” from the iO Pages Tenth Anniversary Compilation, released by that magazine back in 2006, a growling and sputtering slab of intensely funky jazz-rock perhaps informed by Herbie Hancock. Continuing in reverse chronological order, from the hurricane Katrina 2005 fundraiser disc After the Storm we have “The Shattering Sky,” with its swarming cicada intro, driving a dark and powerful rock piece that hovers over some keyboard sequencing with soaring guitar solos lighting up the skies. Also from 2005 we have “Pentimento,” a simmering improvisation which was featured prominently on the Kinections Prog Day CD. Zooming further in the wayback machine, we are treated to 2001’s “New Light on the Dark Age,” which featured on the Fluorescent Tunnelvision compilation, a cut which highlights the band’s more ambient and tribal instincts, and obviously an outtake from the New Dark Age sessions. Two cuts going all the way back to 1990 are presented: “Inventions of the Monsters,” another ambient explorative piece that highlighted the Coriolis label sampler Dali: The Endless Enigma, and the nothing-short-of-exceptional floating ambient intro which morphs directly into DK’s early rock sound drives the title track which was released on the Past, Present, Future compilation LP, an early release on Greg Walker’s Syn-Phonic label. closing the disc nicely, here this cut makes its CD debut. There are a lot of wonderful DK rarities here that are probably no longer available on their respective obscure original releases, so this is a great opportunity to catch up.